I know. I know. Losing weight with hypothyroidism can feel impossible. You’re trying your best to make changes to your diet in the hopes of losing some of the stubborn weight and you figure artificial sweeteners with fewer calories are a good option. But are they? Maintaining a healthy weight can seem like an unending battle. For those with a thyroid condition it may even feel impossible. Weight loss can be complex and requires a lot of self-control and determination prompting many to look for simple replacements or cuts to make in their diet to ease the process. One common choice that people make is replacing sugars with artificial sweeteners. This seems like a legitimate option because they boast fewer calories and offer the sweetness we crave. Unfortunately, many sugar-substitutes also come with some serious detriments. New research shows that artificial sweeteners do not help with weight loss. In fact, they actually contribute to weight gain and difficulty losing weight. Diet sodas – which use artificial sweeteners – are linked to metabolic syndrome, insulin resistance, and type 2 diabetes. Research also links aspartame, an artificial sweetener, to behavioral and cognitive problems including learning problems, headaches, seizures, migraines, irritable moods, anxiety, depression, and insomnia. 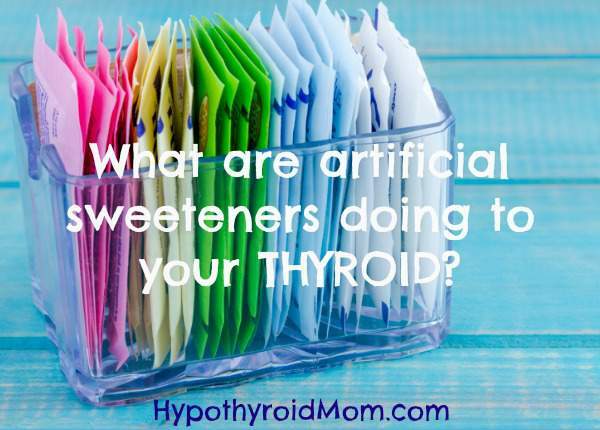 Furthermore, not only do artificial sweeteners hinder thyroid function but they may promote autoimmune conditions, leading to even more severe issues. What’s Wrong with Artificial Sweeteners? Our fear of sugar has led many to pursue substitutes in the form of artificial sweeteners. These man-made compounds are found in a great deal of regularly consumed products. Over 6,000 products such as puddings, frozen desserts, chewing gum, yogurt, chewable vitamins, tabletop sweeteners, and soda contain these unnatural additives. “Sugar-free” drinks and foods are the primary carrier of artificial sweetening agents. In a 2013 Gallup Poll, it was found that most adults drink soda, with a large portion of that consumption being “diet” or “sugar-free” varieties. Heavy consumption of unnatural chemicals is disconcerting. If a product is not found in nature and is not made from natural products, the body is not properly equipped to optimally utilize it. This leads to health issues which can cause long-term damage to the body, particularly the immune system and thyroid. Conditions such as Hashimoto’s Thyroiditis and Graves’ Disease fall into the category of autoimmune disorders. Conditions such as these can lead to chronic cases of underactive or overactive thyroid. Statistical data shows that the most predominant cause of inhibited health quality is autoimmune conditions. These types of disorders are recognized as being two times as prevalent than heart disease. Why is this the case? It may be linked to the large consumption of fake sugars and sweeteners. Chemicals found in many sugar-substitutes may alter bacteria and pH levels in the gut. Maintaining proper balance in this area is critical for proper autoimmune function. In May of 2015, the American Association of Clinical Endocrinologists (AACE) released data suggesting that those with Hashimoto’s Thyroiditis should not consume artificial sweeteners. The study in question showed that of the 100 patients confirmed with Hashimoto’s, who used artificial sweeteners including aspartame and/or sucralose (averaging 3.5 packets per day), experienced increased Thyroid Stimulating Hormone (TSH) levels. This can be a signifier of underactive thyroid, also known as hypothyroidism. Hashimoto’s is known to lead to hypothyroidism, and if this study is indicative of the relationship between sugar-substitutes and inhibition of the thyroid, consumption of fake sugars further promotes development of hypothyroidism. Other studies presented at AACE conferences showed cases where patients experienced a complete reversal of Hashimoto’s when they removed artificial sweeteners from their diet. One such case, involving a 52-year-old woman, showed significant improvements regarding thyroid health. At the beginning of the study, when the patient was regularly consuming a great deal of artificial sweeteners, her test results were concerning. Clearly these numbers are far from optimal. Once the patient had removed all fake sugars from their diet, with no other lifestyle changes, her levels improved greatly. Ultimately this allowed her to cease medication with levothyroxine. Although this case shows that there is a clear benefit in removing sugar-substitutes from one’s diet, the change in one’s levels may not be as prominent. Each case and individual is unique. More research is required to understand the complex interactions of artificial sweeteners on the immune system and the thyroid. Reducing one’s intake of artificial sweeteners may be beneficial in preventing or even reducing symptoms of autoimmune conditions such as Hashimoto’s. However, there are other benefits to avoiding consumption of these fake sugars, particularly aspartame and sucralose. A popular agent used for replacing sugars is aspartame. Found in Equal and NutraSweet, this chemical compound provides several things that aren’t so sweet for one’s health. Two primary elements make up aspartame, the amino acids phenylalanine and aspartic acid. These are both found in nature, and are beneficial when consumed in correct ratios with other compounds. However, the chemically manipulated versions found in aspartame changes the ratio, which can cause various imbalances. When this chemically altered bond is broken down, the body experiences neurotoxic effects which can cause dizziness, headaches, and in some cases seizures. High concentrations of these chemicals can overwhelm the brain, causing neurons to excessively fire, which may even cause cellular death. Additionally, with higher consumption of aspartame, there comes greater risk of neurodegenerative disease such as Parkinson’s and Alzheimer’s. Another common artificial sweetener, found in Splenda, is sucralose. As a chlorinated compound, sucralose can cause serious damage to one’s immune system. Overconsumption of any toxin, including chlorine, can alter the delicate balance of organisms in the gut. A study in the Journal of Toxicology and Environmental Health found that sucralose has a negative impact on the microbiome, an ecological structure of organisms that benefits the body. Usage of artificial sweeteners was shown to reduce good bacteria in the microbiome by up to 50% in addition to raising pH levels. Because this system makes up 80% of the immune system, any significant shift can lead to severe autoimmune consequences. Stressors on the immune system can lead to additional strain on one’s thyroid. Avoiding consumption of any chemically altered or man-made compounds will likely benefit one’s overall health. Although many people have been trained to believe that artificial sweeteners are an improvement over natural sugars, this is not the case. By consuming sugar-substitutes and chemical alternatives, one is simply replacing natural sugars with harmful concoctions that can inhibit the immune system and ultimately the thyroid. Even if the goal is to cut calories, it is almost always better to avoid chemical substitutes. It is best to keep the body healthy by balancing one’s diet with natural products, even if that means using real sugar. Dr. Kent Holtorf is the medical director of the Holtorf Medical Group and the nation-wide Holtorf Medical Group Affiliate Centers. He has personally trained numerous physicians across the country in the use of bioidentical hormones, hypothyroidism, complex endocrine dysfunction and innovative treatments of chronic fatigue syndrome, fibromyalgia and chronic infectious diseases, including Lyme disease. He is a fellowship lecturer for the American Board of Anti-aging Medicine, the Endocrinology Expert for AOL Health and is a guest editor and peer-reviewer for a number of medical journals including Endocrine, Postgraduate Medicine and Pharmacy Practice. Dr. Holtorf has published a number of peer-reviewed endocrine reviews, including on the safety and efficacy of bioidentical hormones, inaccuracies of standard thyroid testing, testosterone replacement for men and women, the diagnosis and treatment of growth hormone deficiency and on the diagnosis and treatment of adrenal dysfunction in chronic fatigue syndrome and fibromyalgia. Choudhary, A.K. et al. Nutr Neurosci. 2017 Feb 15:1-11. Neurophysiological symptoms and aspartame: What is the connection? Suez, J. et al. Artificial sweeteners induce glucose intolerance by altering the gut microbiota. Nature. 2014 Oct 9;514(7521):181-6. I gave up aspartame and sucralose about 2yrs. ago and switched to stevia. Is stevia classed as an artificial sweetener as well? Thank you for keeping us up to date with the latest thyoid information. It just goes to show we constantly need to educate ourselves as my Endocrinologist did not notify me of this. I have been trying to diet and constantly use artificial sweeteners! I will have to rethink my whole strategy now. My pleasure Lee. Wonderful to have you at Hypothyroid Mom. I’d also like to know about Stevia , especially the in the raw brand ? Did you know there is an artificial sweetener in Teva thyroxine? I chew sugar free gum everyday for many years now. Just dawned on me that there is aspartame in this gum. Maybe this is why my thyroid levels are all over the place.